Research methodologies across disciplines are often based on hands-off observation for short-term research projects. Yet in active disaster zones, the imperative to do no harm has less meaning, since harm is already ubiquitous, and the imperative becomes to do good. In this case, a hands-off approach is unethical. This is true whether disasters are “fast,” such as when tornadoes move through rural communities, or “slow,” such as when food sources are contaminated. This chapter responds to a call from Science and Technology Studies (STS) to “make and do politics,” to reconsider research methodologies and ethics that “explore the full spectrum of problem definitions and suggested responses” in a world increasingly characterized by disasters (Castree 2014: 474). 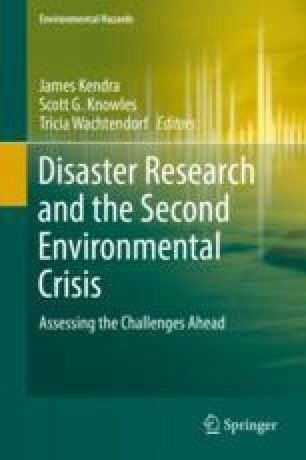 The problem is how to do actionable research when disaster researchers find themselves faced with dilemmas that challenge the institutional norms for ethical conduct and production of sound science. Based on two cases of fieldwork conducted in disaster zones, we argue that research is necessarily “compromised” when it remains faithful to doing good and making change in disaster zones. We extend anthropologist Charles Hale’s framework of “activist research” and the “contradictory and partly compromised path [researchers take] toward their political goals” in action-based research (2006). Our chapter offers a framework for thinking through tactics in this high stakes research contexts. We conclude by suggesting that doing practitioner-oriented, action-oriented research is always “compromised” research, even as these tactics are simultaneously the very condition for doing ethical research that matters to disaster survivors on the ground. Funding for this research was provided by: Social Science and Humanities Research Council (SSHRC) Insight Development Grant (#430-2015-00413); Marine Environmental Observation Prediction and Response Network (MEOPAR); the Advanced Study Program Graduate Student Visitor Fellowship at the National Center for Atmospheric Research; and the Interdisciplinary Graduate Education Program in Remote Sensing at Virginia Tech. 4S. (2016). STS making and doing. http://www.4sonline.org/meeting/sts_making_and_doing_call_for_submissions. Accessed 24 Jan 2016. Grün, F., & Blumberg, B. (2009). Endocrine disrupters as obesogens. Molecular and Cellular Endocrinology, Special Issue: Endocrine Disruptors from the Environment in the Aetiology of Obesity and Diabetes, 304(1–2), 19–29. https://doi.org/10.1016/j.mce.2009.02.018.